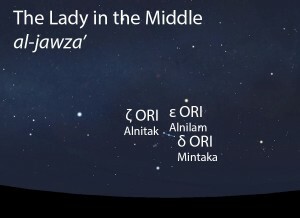 Jawza’ as a rain asterism forms the center of the larger celestial complex also known as Jawza’, the only fully articulated human figure in the ancient Arabian sky. In the earliest times, the name referred to only the three bright stars that are lined up in the middle of the figure. The name “Jawza’ ” is a feminine derivative of the word that means “middle”. Jawza’ as it appears in the west about 45 minutes before sunrise in early December. Sky simulations made with Stellarium. A trio of very bright blue-white stars that are lined up in a perfectly straight line. Each of the side stars is equidistant from the center one. This grouping is known in modern astronomy as the Belt of Orion. In the calendars of Qushayr and Qays, the morning setting of Jawza’ marks the start of the cold winter season called ash-shita’. Jawza’ does not figure in the calendar of the lunar stations. 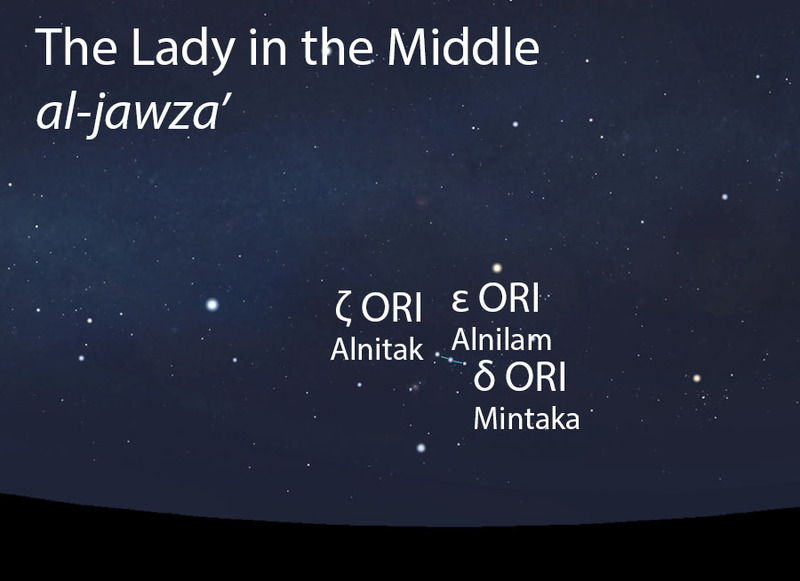 The rain star grouping called Jawza’ expanded over time to become a prominent folkloric celestial complex that retained the name of Jawza’ (al-jawza’, الجوزاء). Within that context, the original three stars of Jawza’ are seen as her Belt of Pearls.